Another week bites the dust, another batch of lipsticks have made the rounds and I’m here checking in with a show and tell. 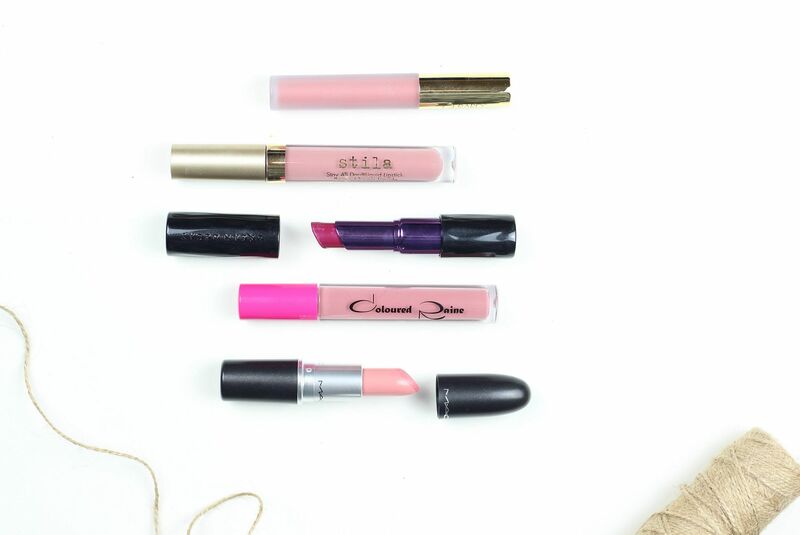 A lot of pink lipsticks this week – I find it really interesting to make a note of the lipstick I wear as this is the thing that changes the most daily. I saw the lovely Jasmine do a post similar to this a while ago and couldn’t resist doing my own. Gerard cosmetics hydra matte lip cream in Serenity. I’m noticing a really consistent pink theme throughout the lipsticks when I look at them all photographed, but that’s cool and we’ll go with it. Serenity is a warm rosy pink with a little brown to make it not too sickly – it is the perfect embodiment of spring lipsticks. Stila stay all day liquid lipstick in Baci. This one looks so pinky when I first apply it, but then changes into this really interesting mauve shade. Love the formula of these, and this is exactly the kind of shade I am obsessing over at the moment. Definitely worth picking up one (or two) of the stila liquid lipsticks if you’re a matte lip lover. Urban Decay matte revolution lipstick in After Dark. I actually wore this two this week – I wore it in the evening to an event and then the next day because I remember how gorgeous it is. If you haven’t tried the UD matte formula, you need to give them a go because they are so creamy and pigmented. Coloured Raine liquid lipstick in Classy. Still testing this one out – I agree with my original thoughts that it makes me look a little dead, but I’m still playing around with it. The second time around I had more face makeup on and it looked better. MAC Creme cup + Soar liner. I did a whole post raving about this particular combination earlier in the week, which you can see here, but this basically is such a pretty little duo to wear in the day. I have been wearing it a lot the last month or so, and this week was no different. If you liked this post you might like this post YSL Kiss and Love on or this post on red lip 101.